Amman Imman Powerpoint Presentation now available! Please visit www.wellsoflove.info for the most current information and resources. We are excited to announce that an updated Amman Imman slide show, available for purposes of presenting the Amman Imman project, can be downloaded at Scribd.com. (scroll down to the bottom of this post to view the slides). The file, in Powerpoint, is just over 17 mb and downloading times may vary depending on the speed of your internet connection. Along with the slide show, a script for making the presentation has been provided within the Powerpoint document. The slide show with the script contains a detailed narrative about the project with the most up-to-date information and pictures that will aid you in understanding the water scarcity problem in the Azawak, the dire circumstances facing the people and Amman Imman's project to construct closed well boreholes. The story told in the script has many details and is designed to provide in-depth information that will help the presenter understand the context of the project. It will be important to tailor the script for your audience. For example, the script can be edited and shortened for student presentations. Also, you may want to add a slide about your own community's participation. To download this document as a Powerpoint presentation complete with the presentation script, please go this link: Presentation-for-Amman-Imman-11-2007 at Scribd.com. Once you are there, select the Powerpoint icon, the first choice next to "Download" in the text box on the left. You will then be able to save the document to your harddrive. 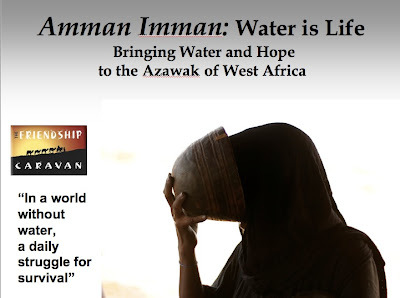 If you have any questions or problems with the download, please feel free to email me at debbie@ammanimman.org. We appreciate feedback, so please send us your comments, questions and suggestions! Important note: if you want the presentation script, please download this presentation as a powerpoint document by going to scribd.com, rather than as a PDF file from here. If you download it as a PDF, you will NOT get the script.